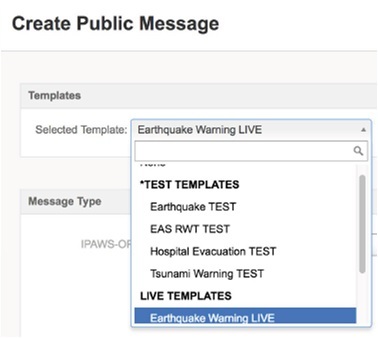 Let’s take a look at the types of automation templates used to create the recent Hawaii alert confusion, and find out more about WEA and EAS in action. Recently, we wrote about the erroneous missile alert issued over emergency notification systems in Hawaii. The alert demonstrated the effectiveness of both broadcast and wireless alerts through EAS and WEA in the United States. A protracted period of confusion and fear took place. Key questions still being addressed include: Why was the false message broadcast? Why did it take so long to correct the mistake? It turns out that Hawaii is the only state authorized to send out a ballistic missile warning. Everywhere else, that’s a federal FEMA responsibility. The duration of the confusion was compounded by the Hawaii officials seeking federal FEMA approval to broadcast a retraction. It turns out that federal approval was not needed and the state wasted 23 minutes trying to get it. At the end of the day, it took nearly forty minutes to properly issue a retraction. The Verge ran an interesting article about the type of automation software used to send alert messages through IPAWS. It describes how emergency agencies create templates for messages, and use menus in the software to select and send these messages. AlertSense is one company that provides these tools. Here is a complete description of how these types of systems are supposed to work. Reading the documentation, you can see how these software tools have built in safeguards, including the “are you sure you want to send this?” confirmation. On the other hand, you can see that if the operator is not paying attention, it is all too easy to just click a bunch of buttons and send the wrong message. Especially if the wrong message is very similar to the right message. Hawaii has now changed its procedure to require two staff to issue an alert of any kind. Hopefully, they are both paying attention. On January 25, Emergency Alert System FCC officials and communication industry leaders testified before the Senate Commerce, Science and Transportation Committee examining the nation’s Emergency Alert System (EAS), including the Wireless Emergency Alert (WEA). In addition, the hearing focused on the false alarm statewide emergency alert in Hawaii on January 13, 2017. This hearing ran for two hours and you can watch the video on C-SPAN. Unfortunately, there was no FEMA representative at the hearing, so a lot of questions went unanswered.